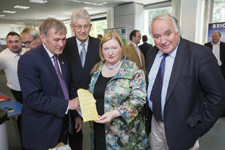 Swansea’s recent collaboration with Cambridge University, Imperial College London and Manchester University in forming the Engineering and Physical Sciences Research Council (EPSRC) Centre for Innovative Manufacturing is being marked with a special exhibition. The Minister and industry experts from Wales visited the Welsh Centre for Printing and Coating (WCPC) and saw new products being developed locally for use in the LAE industry, which provides electronic solutions for areas much bigger than the dimensions of a typical circuit board, such as a large-screen TV. The University’s EPSRC status was secured earlier this year after the Welsh Government’s EU-backed Academic for Expertise (A4B) programme played a key role in securing a share of the £5.6million awarded in total by the EPSRC to the LAE Centre. Swansea was chosen alongside the other universities as exemplar models of how structural funds can be used in combination with research council funding. Swansea University received £1.4million as one of those identified as an academic centre for excellence for the Large Area Electronics (LAE) industry. Utilised by academics at Swansea University’s WCPC, the funding is supporting ongoing research and development work with a range of local companies working within the LAE field. Speaking during the visit, Ms Hart said: “Swansea University’s work in supporting the research and development of new technologies emerging from a wealth of talented local businesses is becoming increasingly important to the Welsh economy. Partner companies including Tectonic International from Aberdare and Axiom Manufacturing based in Newport are among those who showed the Minister products and processes already developed with support from the WCPC. These include a next generation version of elements used in low-energy lighting, and the development of cutting-edge image carriers for use in the printing industry. WCPC Director Professor Tim Claypole, said becoming involved in the EPSRC Centre for Innovative Manufacture for LAE meant the impact of the Swansea centre’s research was being felt more widely than ever. Professor Claypole said: “Being part of this partnership allows the Welsh Centre for Printing and Coating to share best practices identified during research and development with local businesses for the benefit of the wider industry across Britain and Europe.